The Government of Canada is providing $1.5 million to support two cultural infrastructure projects in The Quarters. “Thanks to this funding, the City of Edmonton, Ociciwan Contemporary Arts Collective and the Quarters Arts Society will bring renewed energy to the downtown area through these creative and artistic spaces,” said Pablo Rodriguez, Minister of Canadian Heritage and Multiculturalism. The Government of Canada is also contributing $2.5 million to the University of Alberta to establish an Artificial Intelligence-Supercomputing Hub for Academic and Inudstry Collaboration. Council started hearing from Edmontonians about the budget in a packed public hearing on Thursday. They’ll pick it up again next week. According to the C.D. Howe Institute, Edmonton scored a “D” for its budget documents. We talked about speaking at Council in the latest episode of Speaking Municipally! Of course one of the big discussion items this year is recreation centres. “We fully appreciate the value of these services in the neighbourhoods, and how much people appreciate it, but there is a cost to them, and we have to look at those costs, and put that information in front of council to be fair,” said Roger Jevne, branch manager of community and recreation facilities. Vue Weekly has announced it will stop publishing at the end of the month. “We decided that we would cease publication now, rather than face another year of diminishing resources,” VUE’s president Robert Doull said in a statement. The oil derrick known as Leduc No. 1, which has been located at Gateway Park since 1987, has been dismantled so it can be re-erected south of Devon at the Leduc #1 Energy Discovery Centre. Construction on the Groat Road Bridge means that no buses will be able to cross until work is completed in the summer of 2020. New York Bagel Cafe in Old Strathcona is defending its decision to charge $3.50 for hot water with lemon and is not considering changing its prices. The Oilers traded Ryan Strome to the New York Rangers for Ryan Spooner, who played his first game with Edmonton on Saturday night against the Flames. 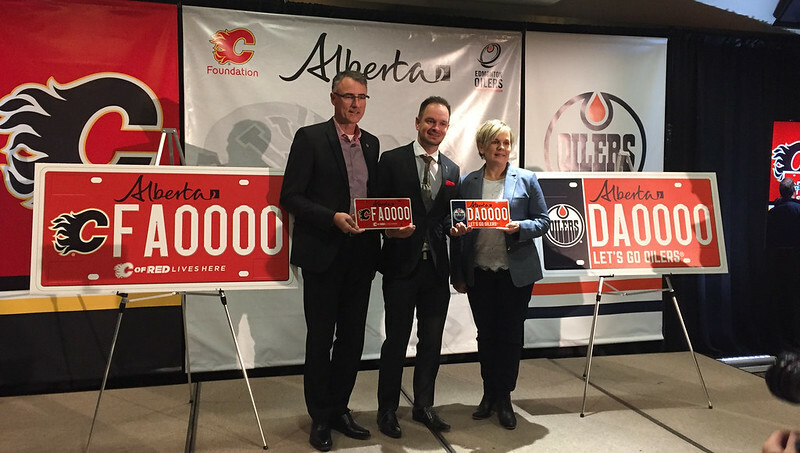 Service Alberta has introduced two new specialty license plates featuring the logos and colors of the Flames and Oilers. The plates cost $75, with $55 going to the Calgary Flames Foundation and the Edmonton Oilers Community Foundation. The giant Christmas tree has returned to Churchill Square! The light-up took place on Friday evening. City Council is off this week, so here’s a recap of recent decisions. Mayor Don Iveson will be speaking with former Pittsburgh mayor Tom Murphy on Monday evening at the Sutton Place Hotel about what drives investment in cities, and what ensures long-lasting commitment. 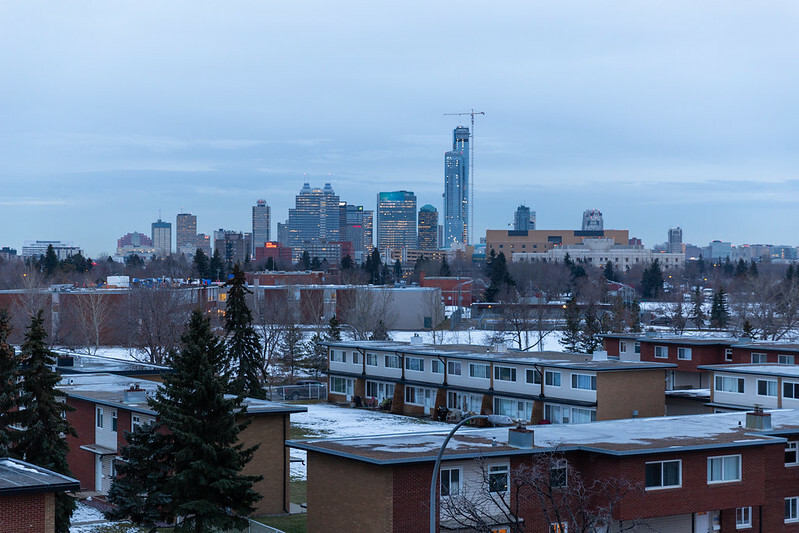 The City of Edmonton is hosting a City Plan Workshop at the Meadows Recreation Centre on Tuesday evening. Shark Tank’s Kevin O’Leary is speaking in Edmonton on Tuesday evening at the Edmonton EXPO Centre. The Grey Cup Festival starts on Wednesday! The kickoff party runs 6-8pm downtown. Support Indigenous artists and makers at the 3rd annual Indigenous Artisans Holiday Market on Thursday at Enterprise Square. The 2 and Out CFL Podcast is hosting a live show on Thursday afternoon at CKUA. The Shaw CFL Awards take place Thursday evening at the Winspear Centre. The City is hosting a year two kickoff for RECOVER, Edmonton’s Urban Wellness plan, on Thursday evening at NorQuest College. Make it Edmonton! runs Thursday to Sunday at the Edmonton EXPO Centre. The Spirit of Edmonton Breakfast takes place Friday morning at the Shaw Conference Centre. A Merry Little Christmas Market takes place Saturday and Sunday at the Prince of Wales Armouries. The Grey Cup Parade starts at 11:30am on Saturday downtown. The 106th Grey Cup takes place on Sunday evening at Commonwealth Stadium.